Remember when you thought Power Steering made your life easier? Just wait until you try Assisted Steering. Ag Leader’s EZ-Steer assisted-steering system does the work for you by automatically steering your vehicle through the field, allowing you to focus on other tasks such as implement performance, or boom control, while greatly reducing driver fatigue. The Agleader EZ-Steer system uses guidance from the Agleader EZ-Guide Plus Lightbar and automatically turns the steering wheel for you. The Agleader EZ-Steer system is perfect for tillage, spreading, spraying, and harvesting operations. For higher accuracy applications such as broadacre planting, couple the Agleader EZ-Steer system with the Agleader EZ-Guide 5100 Guidance system and OmniSTAR HP differential corrections. Using the simple Electronic Motor Drive (EMD), the expense of traditional hydraulic automated steering systems is taken out of the equation. While other systems require you to integrate into vehicle hydraulic systems, the Agleader EZ-Steer system can be quickly installed and transferred between vehicles by simply bolting to the steering column. Installation can be done in most applications in less than 15 minutes and only requires one wrench. While the Agleader EZ-Steer system is simple and inexpensive, it’s certainly not lacking features. 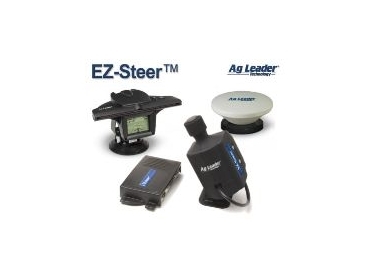 The Agleader EZ-Steer system is capable of performing both straight line and contour guidance. Many assisted/automated steering systems on the market today lack contour guidance, while the Agleader EZ-Steer system is ready out of the box. The benefits of assisted steering really shine when performing contour guidance with the Agleader EZ-Steer system. It’s as simple as driving your first pass and then sitting back and letting the Agleader EZ-Steer system take over the duties across the rest of the field. When you get to the end of the pass, simply turn the wheel and Agleader EZ-Steer will disengage, allowing you to turn into your next pass and repeat. Do you have several vehicles in your operation that could use assisted steering? The Agleader EZ-Steer system can be transferred from one vehicle to the next in minutes. Transferring is as simple as removing the 2 wing nuts from the Agleader EZ-Steer mounting bracket, carrying it, the Agleader EZ-Guide Plus system, and controller box to the new vehicle, and reattaching it to the mounting bracket installed in your other vehicle. Additional mounting kits are inexpensive and available from your local Ag Leader dealer.